Are you in the market for new awnings or you’re getting ready to upgrade your business awnings this spring? ABC Signs is here to tell you the practical and unique benefits to why you should get on board with commercial awnings. Commercial awnings add that certain “it” factor to a business that draws attention and makes people take a double take! 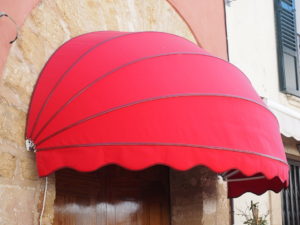 An awning can also vamp up your business front encouraging passersby on a hot & humid summer day to view your window display as they stand in the shade. Awnings are a fantastic means of cutting energy-cooling costs. Awnings help block the sun and heat from windows – thus decreasing electricity expenses. Research shows that 11% of business owners improved their electricity performance by controlling sunlight into their retail or office space. When it comes to awnings today, you can get about just any sort of shape, color, pattern & trimmings, making it easy for businesses to use as a promotional tool. Use your awning as a unique business trademark and an extension of your business branding.